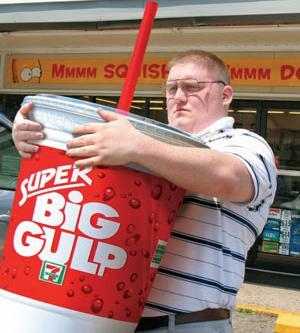 New York – Thousands of soda drinkers will slowly walk one hundred yards to the Mayor’s office tomorrow to protest the city ban on large size sodas which goes into effect Tuesday. Several hundred were already camped today at City Hall Park, the starting line for the “march,” sitting on strained lawn chairs, coolers filled with forbidden colas. Organizers of the “Liquid Courage” protest say 30,000 soda drinkers are expected to march to the Mayor’s office, where a White Castle buffet will be available at the finish line, thanks to a generous gift from the Soda and Sugared Beverage Association of America. “We’re coming for you, Mr. Nanny Mayor,” spokesman Seamus Azucar said. UPDATE: despite a judge’s ruling, protesters were still planning to march on City Hall. “I didn’t go and put sweat-pants on for nothing,” Mr. Gathers said.